They're a lot of fun and we enjoyed their company. I love the winter scenery when we travel. I am fascinated by the icicled cliffs along the highway. These photos were taken from the moving vehicle on our way to Montreal. There is no way to safely stop to take pictures, so I just aimed the camera in the right direction, pushed the button and hoped I could capture some of the majesty of the cliffs. I didn't even roll the windows down. They're even more impressive in real life but I was amazed that the pictures are as good as they are. 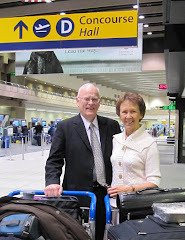 When we arrived in Montreal we went directly to the mission office to get the keys to Sis. Abrams apartment. She was our hostess for the night. I was so excited when the first person we met when we climbed the stairs was Elder Grant! We had not seen him since he had transferred out of Val d'Or in April of last year. 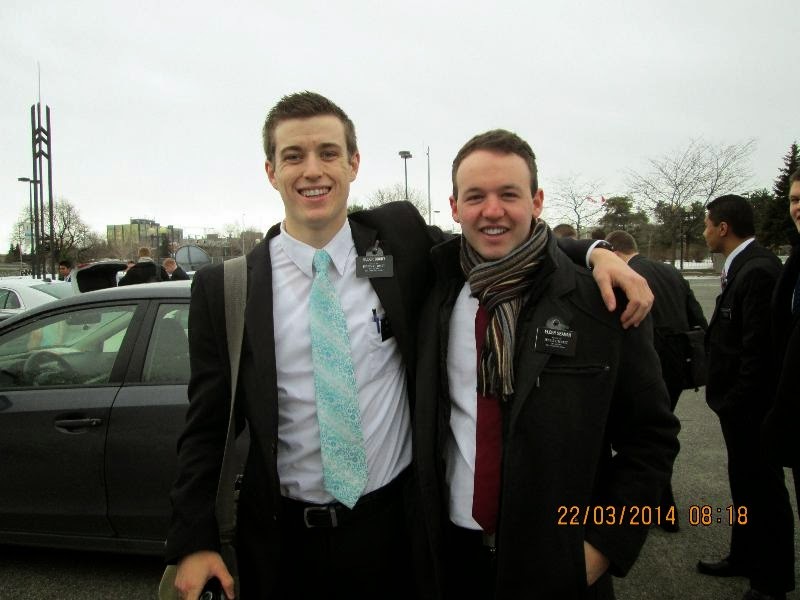 After a short visit with him, who should saunter down the hall but Elder Marcus Smith! 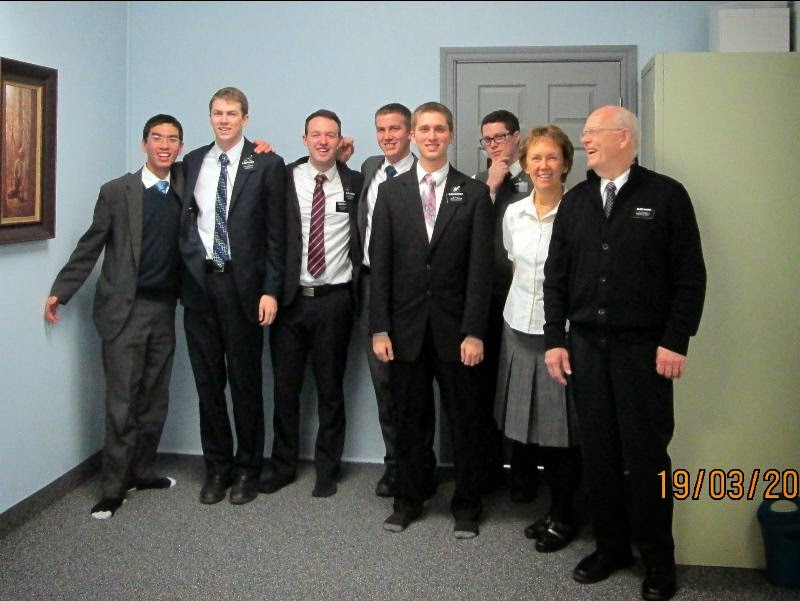 What a nice surprise to see the two elders we had first served with there together. We hadn't expected to see them until Saturday. We were able to enjoy about a 20 minute visit with Elder Smith before we had to leave, as we wanted to get to the temple for the 6:30 session and now had to fight rush hour traffic. It was so nice to be in the temple again and enjoy the peaceful spirit there. 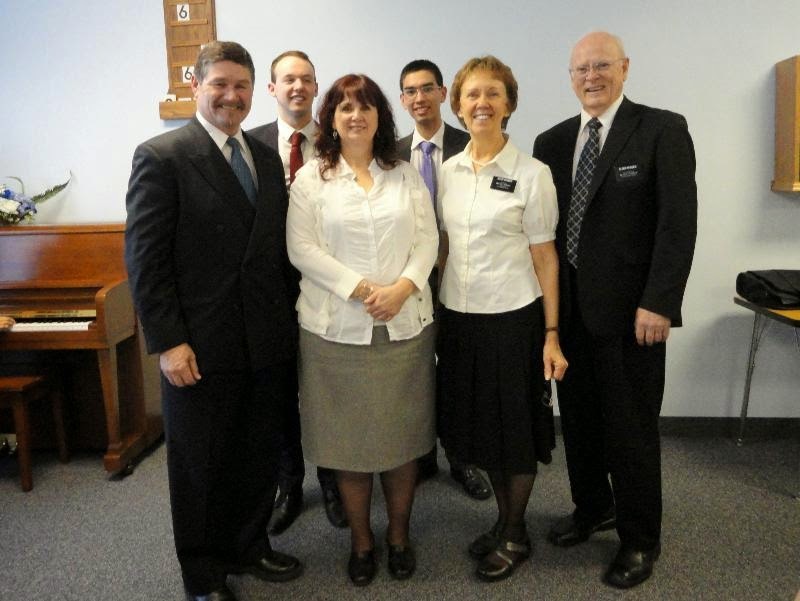 Many of the patrons were missionaries. 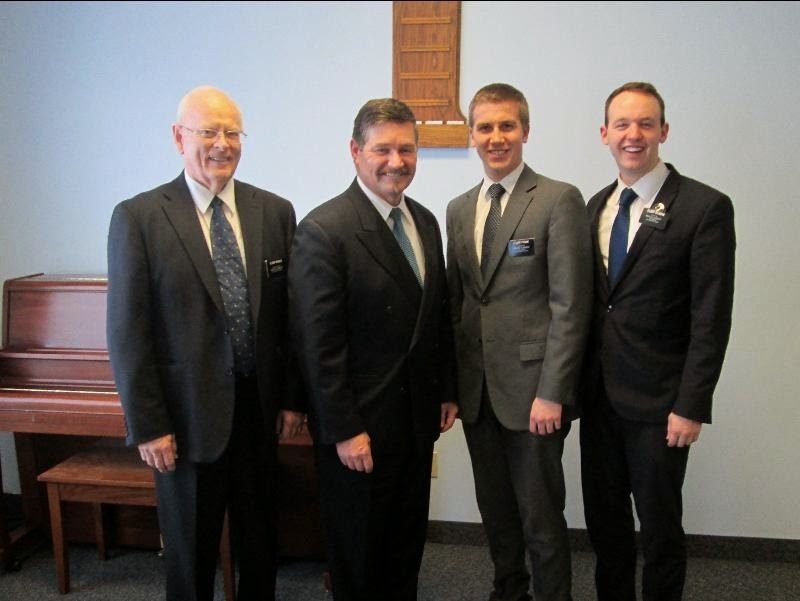 President Patrick wants to give all the missionaries in the Montreal mission an opportunity to attend the temple at least once during their service here. The temple will be closed in June for at least a year for renovations, so this conference provided an opportunity for those of us who serve out in the boon docks to attend. The Montreal temple is the smallest temple I have ever attended, but the Spirit is just as strong, whatever the size. The conference was wonderful! It was great to receive training by an apostle and others who work so closely with President Monson. I loved that Elder Anderson said that if we can help others increase their faith in Jesus Christ, whether they join the church or not, our time has been well spent. 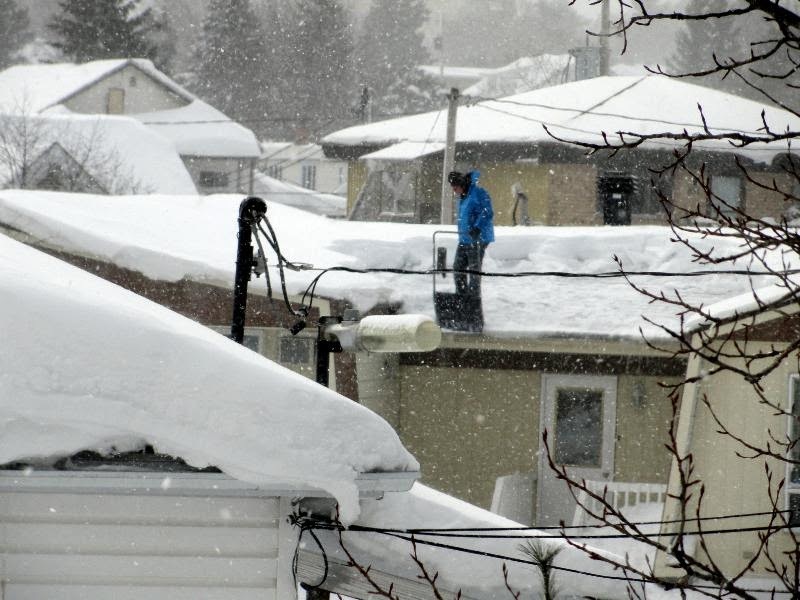 Montreal had a lot less snow than Val d'Or. The sidewalks and roads were all dry and in many places we could see grass. So I switched from boots to shoes on Friday. When we arrived at the chapel for the conference at nine on Saturday morning, a few snowflakes had begun to fall. 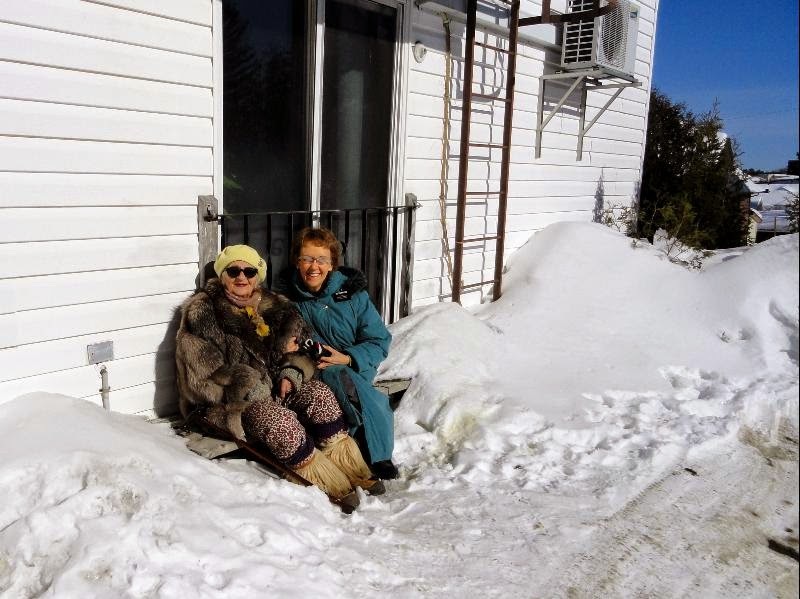 By the time we left the building, around one o'clock, there was about a foot of snow on the ground! 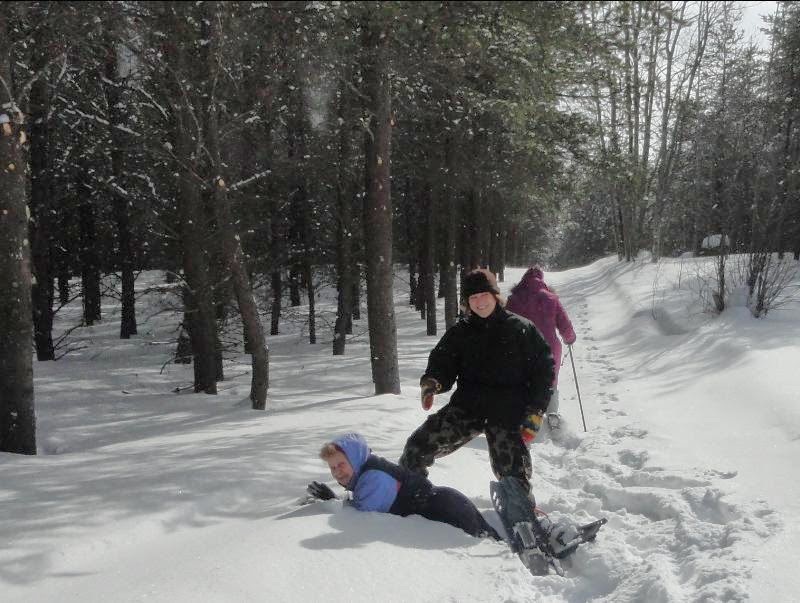 And it was slippery! My feet went out from under me and I landed with full force on my left hip. Thankfully, I didn't break anything. I needed a crutch for support for several days and was stiff for a couple of weeks, but I'm basically back to normal now. but Elder Seaman shared some of his. Typical tempo lined street in Montreal. The Elders about an hour after leaving Montreal and after lunch. The Elders a couple of hours later! The next weekend was also very special. On Saturday afternoon we were privileged to attend the baptism of Josette Boucher. She had been investigating the church since last November. We loved her and felt like she was a member from the first time we met her. She has a strong testimony of the restored gospel and will be a great strength to the branch. Our stomachs and our spirits were both filled that evening. 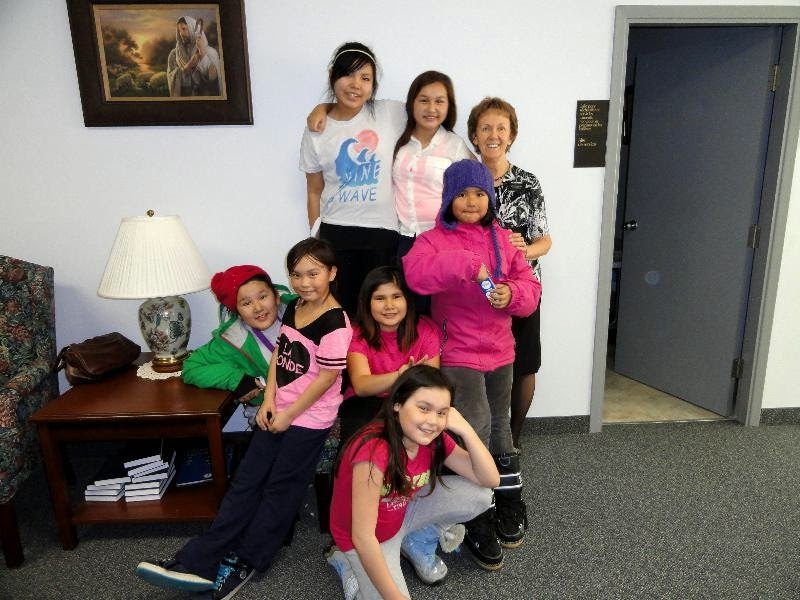 Elder Seaman and Elder Thia in back. Eight of my favorite people. We discovered this new, large skating oval close to our apartment. 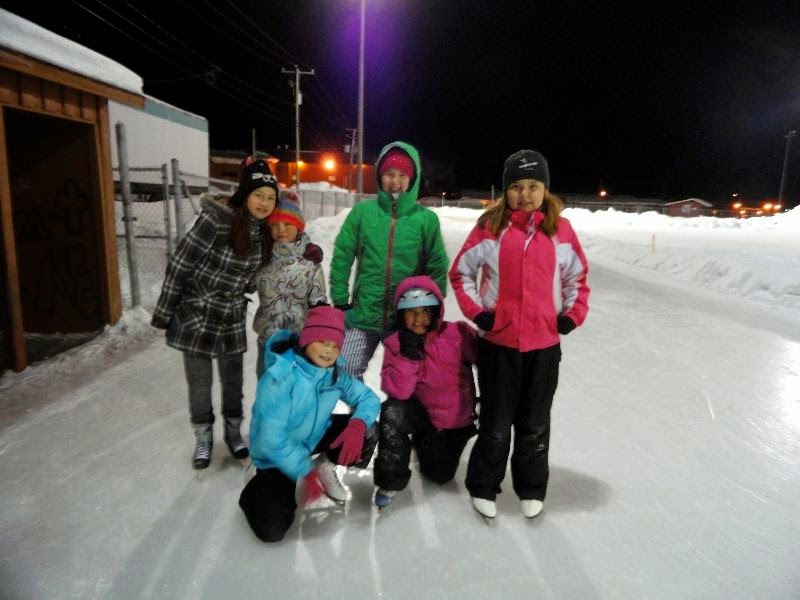 The temperature was - 20 that evening but the kids up here are not usually deterred by cold weather. 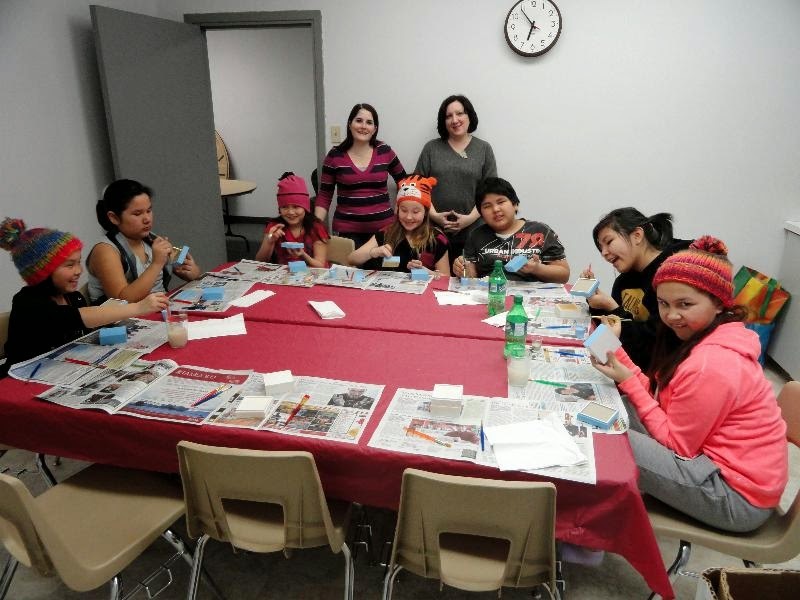 Fabienne Racine, our Young Women President, from Amos (almost an hour north) and Valerie Ochs, my first counselor, from Rouyn-Noranda, try to come to one activity a month. Sis. Ochs taught us how to make beautiful little boxes to encourage the children to save money for something special, like a tropical vacation. half an hour past Rouyn-Noranda. 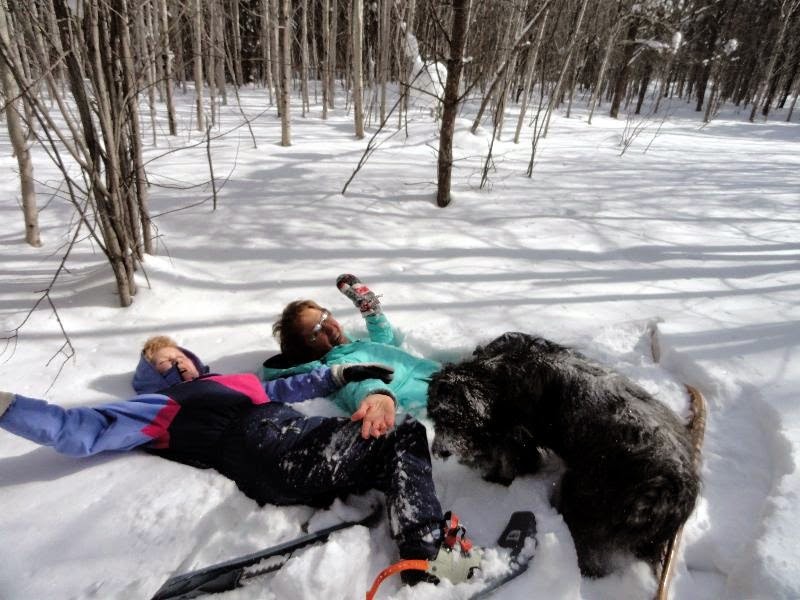 We went snowshoeing (raquettes). 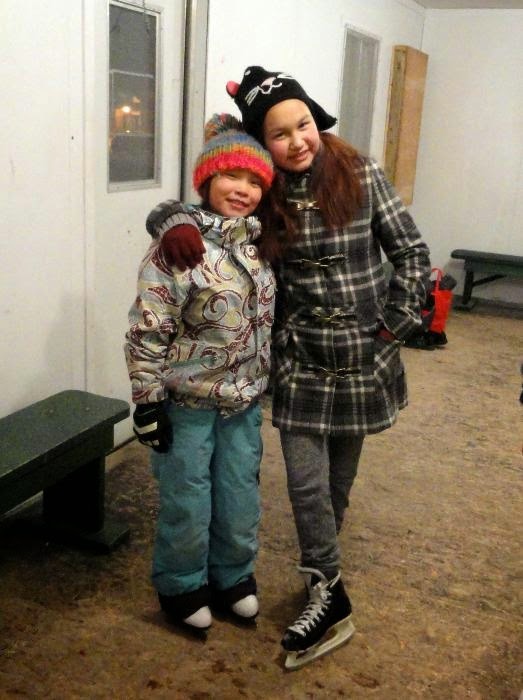 The weather was a balmy -12 with only a light wind. 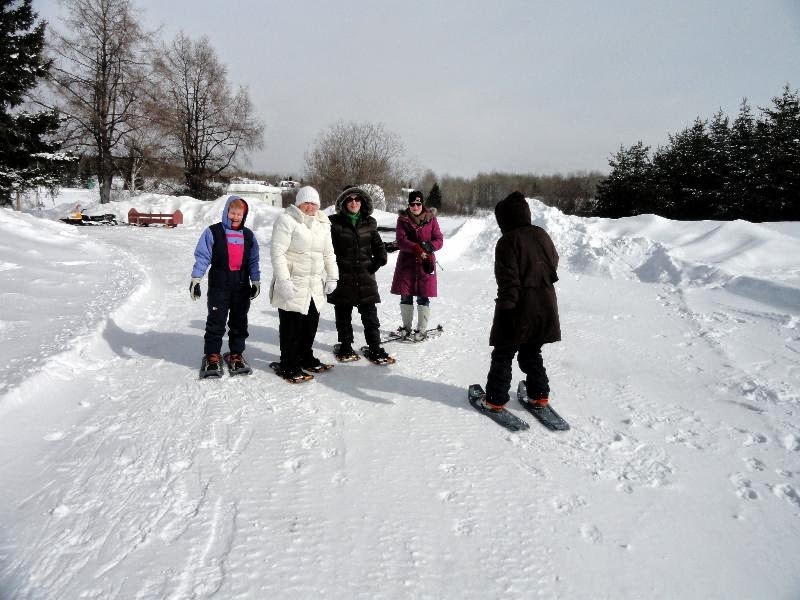 Most of the snowshoes were made of modern materials but Monica saved me a pair of traditional ones. Normand Roy is a trapper by trade and lives near his trap line. It's beautiful country. Monica stopping to help Nicole. The snow is deep. The dog is standing and plowing through the snow with his head down. Often the snow clings to the branches as if nature had dropped cotton balls onto the trees. This is just a small example. 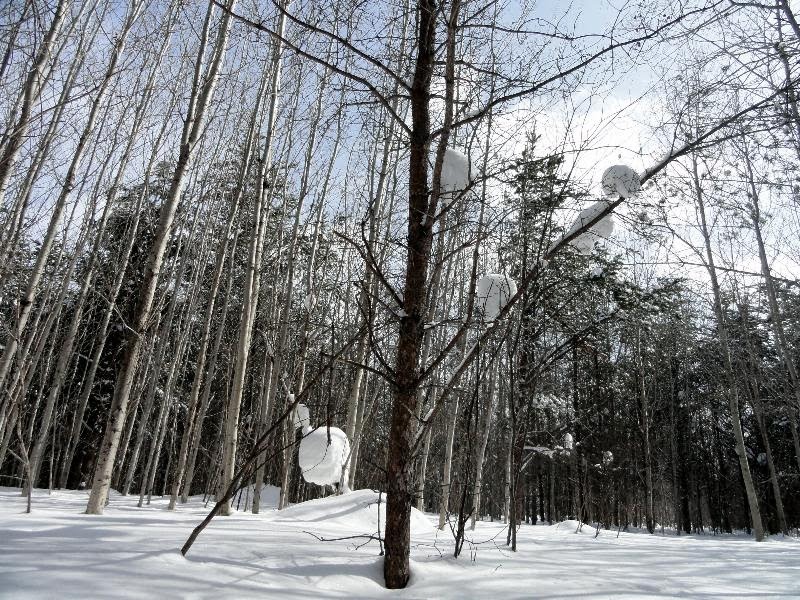 Sometimes the trees along the highway are covered with snow balls for miles. Unfortunately, I've never been able to get a picture of it. I got the picture above from the following position. My turn to fall. Nicole's attempt to help me up backfired. The dog thought it was time to play. I zoomed in to get this shot of a neighbor a couple of houses from us. And you thought shoveling the sidewalk was a pain! "taking the sun"; sometimes in front of our apartment, as you see here, but often on a lawn chair in her front yard, wrapped in a blanket with a hot brick to keep her warm. and is now one of our zone leaders. 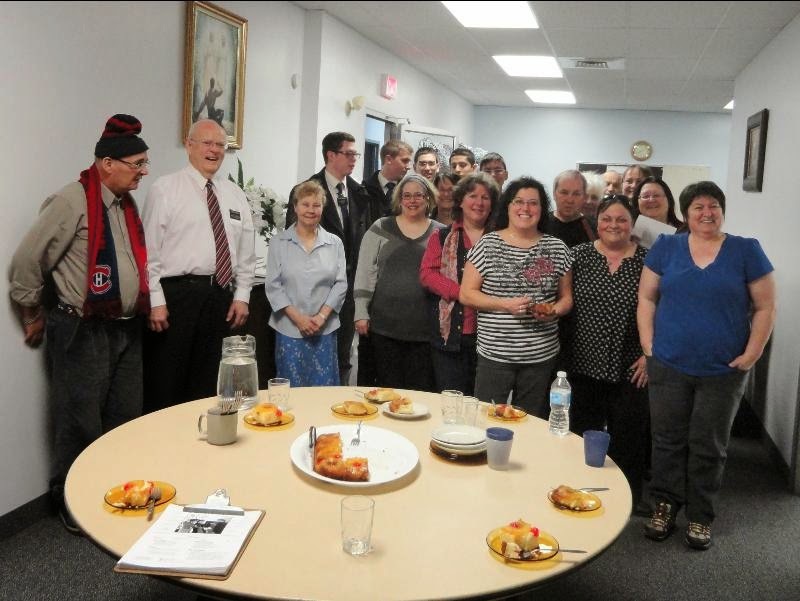 Elders Thia, Pehrson (ZL), Seaman, Fronk, Messinger (ZL), Russell, and Sis. & Elder Rhodes. We had three cameras taking timed pictures, one of them on rapid setting, and this was the best I could come up with. Does that tell you something? This is only one example of their antics. Transfer calls came at the end of March and we lost Elder Seaman. He had been with us for eight months! Besides his regular missionary responsibilities, he spent a great deal of time and effort straightening out the branch records. He was a great support to the branch and the members were sorry to lose him. You already know how I feel about transfers. 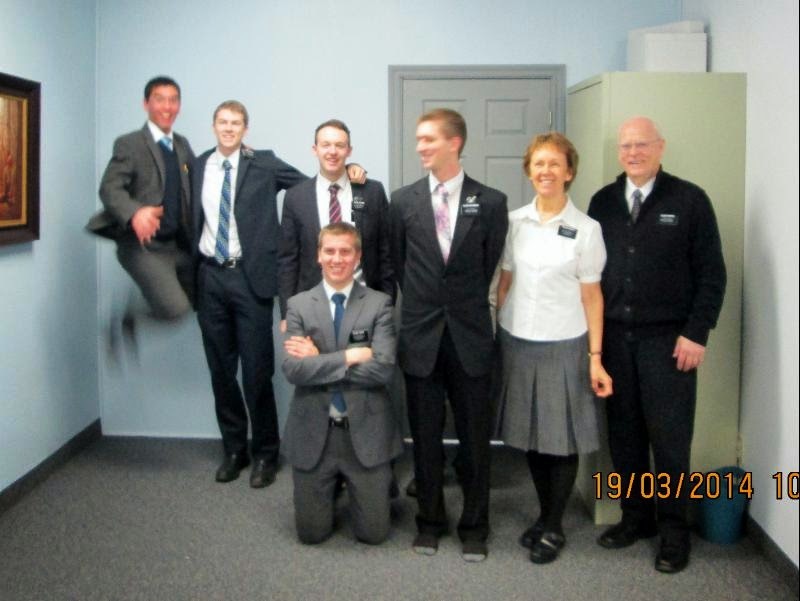 But that's life in the mission field! Branch Presidency Before Elder Seaman's Transfer. A former investigator, Natasha, came to Men's Night to say goodbye to Elder Seaman. 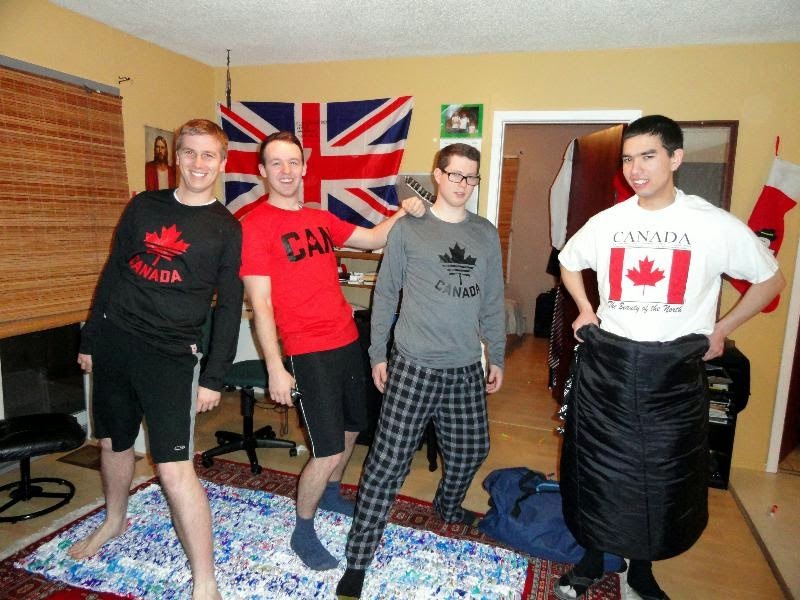 Proud to be serving in Canada. 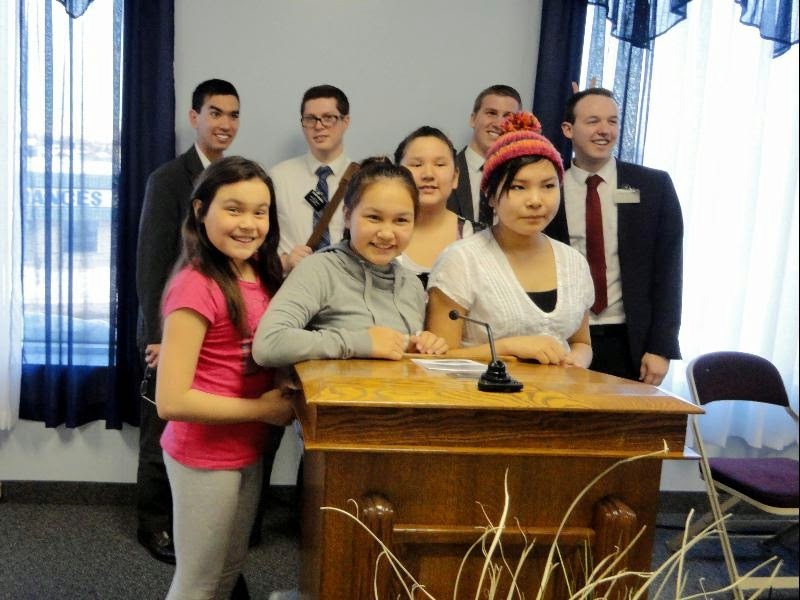 Elders Fronk, Seaman, Russell, and Thia. but I made his favorite cake and the English class was happy to help him celebrate.